Angela B. Peterson is a veteran criminal defense lawyer who has dedicated her career to the zealous and passionate defense of clients charged with felony and misdemeanor charges in state and federal court. Ms. Peterson received her Bachelor of Communication Arts from Wayne State University and Juris Doctor from Wayne State University Law School. She was a Merit Scholar at WSU. 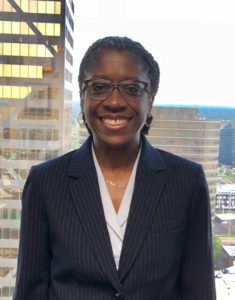 She is admitted to practice law in all Michigan state courts, as well as the United States District Court for the Eastern District of Michigan. As a lifelong musician, entertainment law piqued Ms. Peterson’s interest initially and became the starting point of her career. Her desire for helping people caused an expansion of her practice to include family law. It wasn’t long thereafter that her innate abilities as an advocate and keen sensibility for the facts and ensuring that the rights of people are not violated, quickly led her toward criminal defense. She has now enjoyed a successful 15 years defending criminal charges, with an impressive acquittal rate that has earned the respect of countless judges and prosecutors. The respect she has earned as a result of her continuous and exemplary results allow her to handle felony and misdemeanor cases from a power position. She is active in public service and community outreach. Although her focus today is on providing exemplary retained criminal defense practice, she proudly dedicated several years sharpening her litigation skills while providing public defense in Wayne and Oakland counties. She’s tried a multitude of capital cases (including homicide and criminal sexual conduct) and her ability to persuade a jury is highly renowned. She maintains a great rapport with the bench and bar as a vigilant defender and consummate professional, affording her clients the benefit of zealous and effective negotiations when necessary. Ms. Peterson’s passion, professional relationships, and experiences have distinguished her as an attorney known for her prowess in and out of the courtroom. She has earned a reputation as fearless and tenacious when it comes to fighting for the best results for her clients. Ms. Peterson participates in continuing legal education and her professional memberships include the State Bar of Michigan (Criminal Law and ACES sections), and the Wayne County Criminal Defense Bar Association. If you would like to contact Angela Peterson, please contact her for a free consultation at (248) 263-6800 or email her directly at apeterson@notafraidtowin.com.